apologize in advance for the language at the end. Nobody seemed to mind. 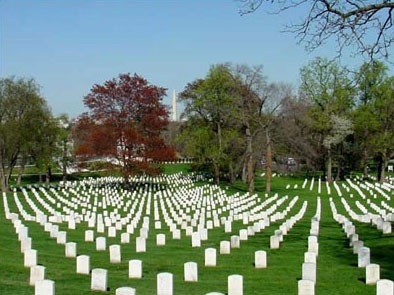 ​ Arlington. My father had a military funeral, which is a stunning thing to witness. One winter my granddad moved in with us. I guess he was in between jails. Soft as a sack of nails. Rant about taxes and war. And pound his cane on the floor. Then he'd drink and he'd yell some more. When Mama made Dad throw him out. What all of the noise was about. But I only came up with two. And crossed the Potomac at one. Watching over George Washington's land. So I took my grandfather's hand. you could tell she would never be the same. Granddad said, “There are 400,000 here, row after row after row. Each of them willing to die for a 10 year old boy they will never even know. Sometimes has to be done. You can't always tell who's won. You asked about all of the yelling. You're wondering about all the beer. and he smoothed his ragged gray hair. Like he had invited them there. And blistered the sanctified air. Every goddamn penny goes here. But all of my money goes here. The old guy eventually passed. He's there with his buddies in Arlington. Thank God he's quiet at last. And I take my whole family there. And look like a family in prayer. We blister the sanctified air. And all of my money goes here. All of my money goes here.